You are here: Home / 2012 / November / 26 / Christmas Jumpers, Wine, Bloggers and Debbie Bliss! Save The Children think I’m a popular and “on trend” knit blogger! In fact I am, apparently, one of the Knitterati!! With flattery like that, how could I say, “No” to their invitation to spend an evening with them and Debbie Bliss at their “Mary’s Living and Giving” shop in Primrose Hill, North London? Save the Children were launching their Christmas Jumper day fundraising campaign and wanted to launch it with the help of knitters. On 14th December, more than 250,000 people (and counting!) will be wearing a festive woolly to school, offices and workplaces all across the UK, with everyone taking part donating £1 to Save the Children. It was pointed out (after a couple of glasses of wine) that these also looked rather good on the neck of a wine bottle too!! I think mine are going to end up on the Christmas tree…. I can’t believe you’ve never used Debbie Bliss Rialto, it’s so soft and delicious. I think you were one of the first knitting blogs I read as well. It’s hard to remember 4 years down the line, especially with as full a feed reader as mine! Glad you had a good night, it looked fun. Lovely to see it all from another perspective, and great to meet you! It would be lovely to meet up as group somewhere rather boring with nothing else to concentrate on and get to know each other better, it was all rather a blur, albeit an enjoyable one, and I’m only now gradually getting faces with names and blogs. By the sound of it this won’t be the last such occasion! I’m trying to work out who it was who showed me the most fabulous asymmetrical scarf. (Was it you?) I think the pattern’s on Ravelry but I can’t remember what it’s called or whose pattern it is. The jumpers are just right for commuting knitting by the way, I finished my Father Christmas on the train back to Norwich! Fab blog update Susan! Thanks for the links etc! It was great to meet you, Susan! Ditto what Penny said – I’m only just managing to link names with blogs and twitter names, especially as with various aliases to deal with! I hope the knitting is going well. What a great time you had! Love your knitted sweaters. We are having a ‘Christmas jumper’ day at school! 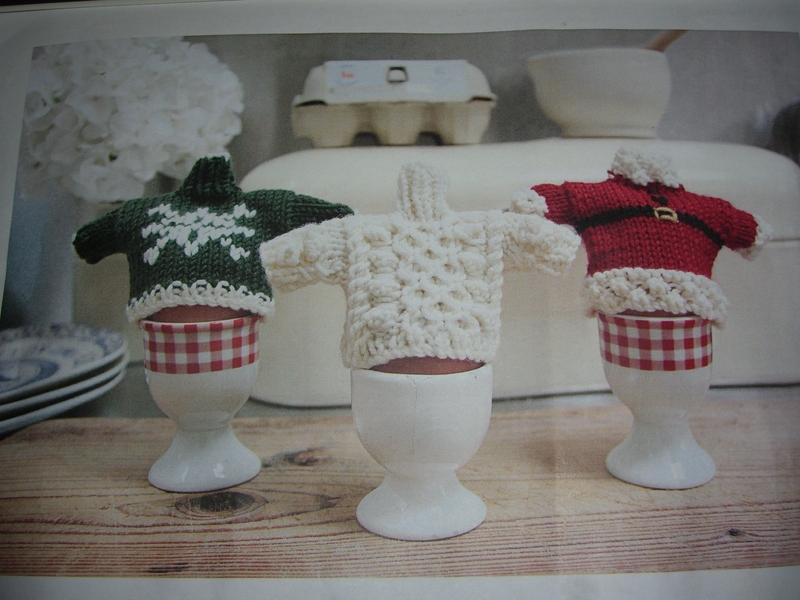 Love those Christmas Egg Cosys. Might make a matching one for my husband!